Day 1: KTM-PARO. Transfer to hotel tiger nest resort, set in the pine trees in direct view of the most famous buddhist monastery in the himalayas. Day 3: PARO/THIMPHU: morning in paro visit to the fortified tower ta dzong, now a natural history museum- one of finest in asia. after lunch drive to thimphu (2 hrs) and visit handicrafts center. overnight in thimphu hotel. Day 4: THIMPHU: MORNING VISITS TO: the memorial chorten and the national library. 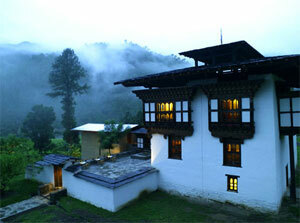 after lunch visit the handmade paper factory & the school of thanka painting; stroll about town; hotel. Day 6: PUNAKHA/GANTEY GONPA: excursion to serene gantey valley, home of the rare black-necked cranes that winter over from tibet (oct-march); visit the gantey gonpa monastery-one of only two ngyingma (old sect) monasteries in bhutan. overnight at farm house or lodge. Day 8: PARO- KTM/DEL: transfer to paro airport to ktm.